Nintendo and Marvel announced in a press release that MARVEL ULTIMATE ALLIANCE 3: The Black Order, the upcoming action RPG exclusive to the Nintendo Switch, will launch on July 19th. MARVEL ULTIMATE ALLIANCE 3: The Black Order brings gamers and Marvel fans together in a new action RPG exclusive to Nintendo Switch. With a huge cast of Super Heroes to choose from, assembling your ultimate team, strategically combining skills to unleash powerful attacks and preventing galactic devastation with friends has never been more fun or immersive. 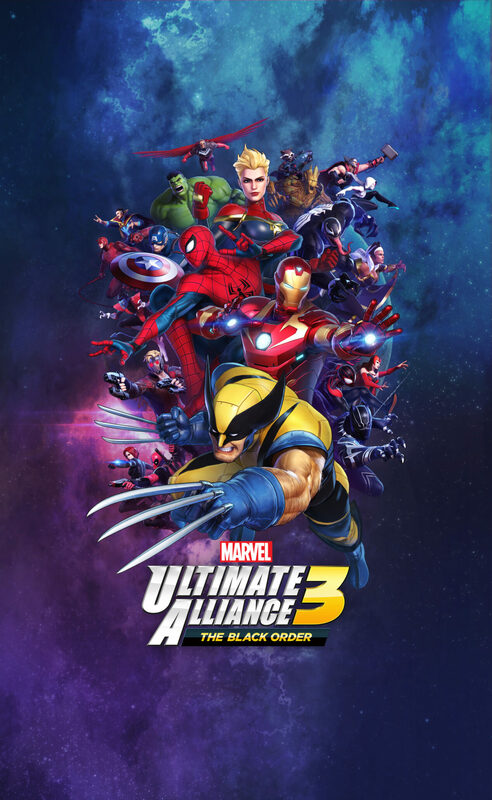 Teaming up with Nintendo to bring MARVEL ULTIMATE ALLIANCE 3: The Black Order to the Nintendo Switch system elevates the MARVEL ULTIMATE ALLIANCE series to even greater heights. With the ability to play at home or on the go, solo, co-op and online with friends, Marvel fans can save the world from Thanos and high stakes threats in any way they like, anytime, anywhere. The game developed by Team NINJA (Dead or Alive, Nioh, Ninja Gaiden, Hyrule/Fire Emblem Warriors) will feature a large cast of heroes as they try to stop Thanos and his titular Black Order. Here’s a list of confirmed playable characters below. Are you looking forward to defeating Thanos yourself after (presumably) witnessing it in theaters with Avengers: Endgame? Marvel Dream Teams – Assemble your dream team of Super Heroes from the Marvel Universe, each with their unique superpowers. New Heroes – The Guardians of the Galaxy, Captain Marvel, Falcon, Scarlet Witch and more join the “Ultimate Alliance” for the first time. Original Story – Super Heroes and Super Villains battle Thanos and The Black Order across the Marvel Universe in this new original story. Local and Online Multiplayer – The game can be played offline or online* with up to 4 players** on a single screen or using multiple systems. Heroic Camera – In addition to the series’ traditional perspective, players can also select a dynamic, zoomed-in view, allowing for a more immersive play style for single-player or multiplayer when using multiple systems. Multiple ways to play – Play with the Joy-Con™ controllers or the Nintendo Switch Pro Controller (sold separately).